"Three-hour window. Don't be late." Janelle Asselin had a vision; reviving a lost genre in romance. To achieve that goal, she enlisted the talents of some of the best writers and artists in the industry for her imprint Rosy Press. 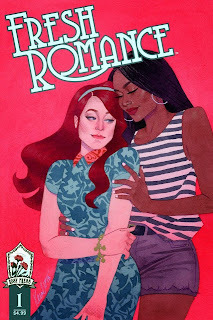 The first book to come out of that shop is Fresh Romance #1, a collection of stories that afford the creators their own interpretations of romance. "School Spirit" is written by Kate Leth, illustrated by Arielle Jovellanos, colored by Amanda Scurti (color assists by Ensley Chau and Claire DeZutti) and lettered by Taylor Esposito. "Ruined" is written by Sarah Vaughn, illustrated by Sarah Winifred Searle and lettered by Ryan Ferrier. "The Ruby Equation" is written by Sarah Kuhn, illustrated by Sally Jane Thompson, colored by Savanna Ganucheau and lettered by Steve Wands. Fresh Romance #1 is the first of a new digital romance comic magazine from Janelle Asselin that includes more than 40 pages of content $4.99. The first issue is broken into three stories. “School Spirit” is a lighthearted take on classic high school romances with two queer women in the lead. Because Malie and Justine want to keep their romance a secret, they pretend to be competing over the same guy, Miles, but Miles also has a secret. “Ruined” is a classic Regency romance, with lots of attention to period details. Catherine and Andrew are getting married – but neither one of them is happy about it. “The Ruby Equation” is a story about love in a coffee shop – where barista Ruby is on a mission to help people find love so she doesn’t have to deal with people anymore. All three stories revolve around the notion of romance and they all work exceedingly well, both individually and as part of a whole. "School Spirit" taps into the trials and tribulations that come with being a teenager full of hormones in high school and turns it slightly on its head, as Leth offers up relationships that are unconventional when calibrated against what past stories in that setting have showed us. "Ruined" is a fascinating look by Vaughn at love in an older time, when emotions were set aside for the betterment of one's family name and possessions. "The Ruby Equation" adds a supernatural spin on things, as Kuhn uses that device to her advantage in explaining the rationale behind a character wanting people to fall in love that's not entirely altruistic. All three stories seek to offer up a more modernized take on romantic situations that society has made easily recognizable to many. The art across the three stories is varied and appropriate for each one. Jovellanos invokes an Archie feel in her work in "School Spirit," with characters evincing a modernized sense of nostalgia in terms of their appearance and demeanor. Searle's illustrations in "Ruined" are much more old-fashioned, with the elegantly simple design a proper representation of the sensibility at the time. Kuhn's work in "The Ruby Equation" is very bold and features strong lines that make a seemingly ordinary day at a coffee shop feel grander than it actually is. There's a difference in style across all three stories, but that difference isn't so disparate that the book feels disconnected across stories. 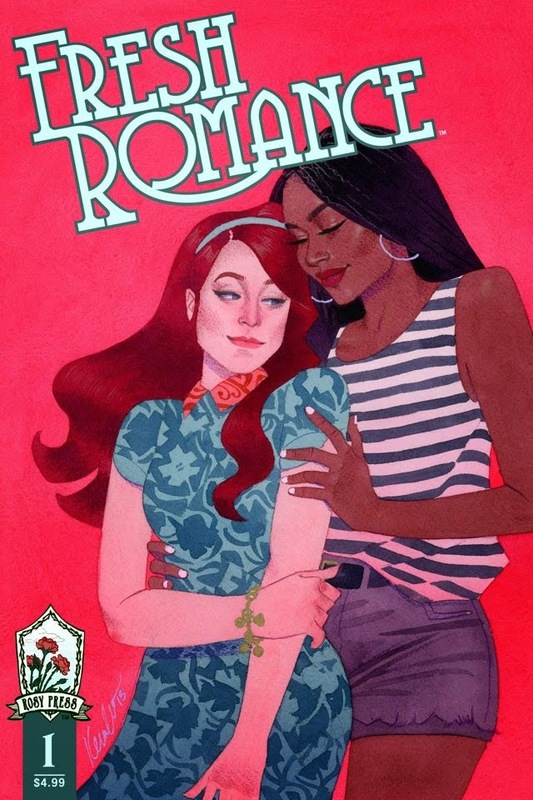 Fresh Romance #1 features three stories that offer new looks at the concept of romantic relationships. The overarching goal of the issue (and presumably series) seems to be one of redefining what a romantic relationship is and each story does a great job of doing just that. The writers for each story all offer their own takes on the concept that blend together pretty seamlessly, starting what seems to be mini-ongoing series contained within the magazine. The artwork is varied yet appropriate, offering vibrant looks at interesting stories. Fresh Romance #1 is a solid start in revitalizing a genre and Asselin and crew are off to a great start. Fresh Romance #1 is available now via Comixology or the Rosy Press website.